A joint concert trip to India was the starting point for Elisabeth Deinhard (flute) and Michael Thele (guitar) to form the “Duo Feliz”. 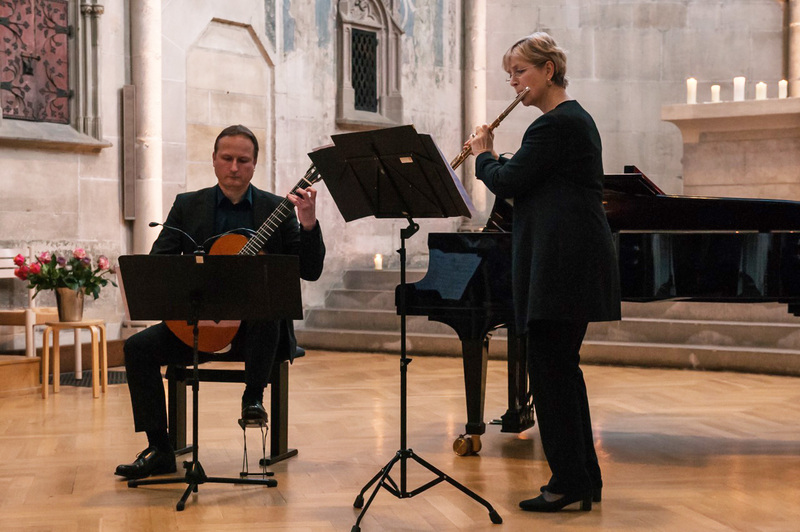 The delightful chamber music combination “flute and guitar” has inspired many composers such as Astor Piazzolla, Gabriel Fauré, Joaquin Rodrigo and Toru Takemitsu to create works for this instrumental combination. In addition to the original works of various epochs and histories, it offers a large selection of sound poetry and musical expressiveness of flute and guitar from the fund of more than four centuries of music history. The “Duo Feliz” spans a wide range from the Renaissance to the Viennese Classical period to contemporary compositions. Studies at Colleges in Essen, Stuttgart and as a DAAD scholarship holder in London, teaching at the music schools in Velbert, Köngen and Tübingen and at the College of Education in Reutlingen, contact studies conducting, concert tours to the USA, Canada, Belarus and the Middle East, member of the Artemis – Ensemble Stuttgart, which is particularly committed to the works of female composers, CD recordings and more with the trio Con Brio – Flute, Viola and Guitar – (Impressions / Night Music / Landscapes, Portraits and Women).